Here at Delta Arlington Towing, we spend lots of time speaking with customers trying to expedite their service. Whether they are stuck on the side of the road and in need of roadside assistance or just looking for a Arlington towing company, at Delta Arlington Towing, we understand just how frustrating waiting can be especially when you’re in an emergency situation. To help better speed up the overall process and get you the best service available, we’ve provided below a few tips for you. Follow the guidelines below and you’ll be on your way to fast, reliable, and affordable Arlington towing and roadside assistance service thanks to Delta Arlington Towing. Step 1: Know Your Vehicle Details: While this type of information might seem obvious, quite often customers don’t know the make, model, year and color of the vehicle. With this information, we can most easily locate your vehicle on the side of the road as well as figure out what type of Arlington tow truck we need to tow the vehicle. Lower rise vehicles, sports cars, and medium to heavy duty types of vehicles require a different type of tow truck than a normal four-door sedan. That’s why it’s very important you know the exact details of the car. There is a big difference between a Ford F150 and F250! 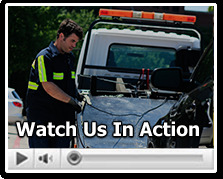 Step 2: Know What Happened to the Vehicle: At Delta Arlington Towing, we understand that most of us aren’t mechanics. Yet knowing the basics of what happened to the vehicle is very important in determining how the vehicle can be towed. If you have 1 flat tire, do you have a spare? Our Arlington towing roadside assistance team can help you change it! Do you have multiple flat tires? Are the tires still attached to the vehicle? If you’ve been in an accident, what damage has the vehicle sustained? Once again, obtaining all of this information BEFORE the call will help get you through the system more efficiently and faster and get you back on the road! Step 4: Know Your Location: If you don’t know where you are, how are we supposed to know! When you find yourself in need of roadside assistance or an Arlington towing company, use a cell phone GPS or walk to the nearest intersection. If you have an exact address, that’s always the best. If you are on a highway, figure out which highway you are on, which direction you are heading, and what is the nearest exit or an exit you just passed. Having this information will help us locate you faster and more effectively and dispatch someone to you sooner. Often the main reason it takes time to get a technician to you is that we cannot find where you are located! Step 5: Know Your Number: We understand that sometimes we forget our own telephone number, especially in an emergency situation or if you just got a new number. If for whatever reason you don’t have a call back number or you are calling from a business/hotel, it’s important to make sure you know the phone number and to stay by the phone. Without a call back number, our technician will not be able to get in contact with you to ask you any other related questions. If possible, use a phone of another individual at the vehicle. This is very important. Next time you find yourself in need of an Arlington towing and roadside assistance company, giving Delta Arlington Towing a call. See why thousands of customers throughout Arlington have trusted Delta Arlington Towing with all their Arlington towing and roadside assistance. The difference is clear: Delta Arlington Towing.